Following a genuine classic with the Daleks in ‘Genesis of the Daleks,’ Doctor Who attempts to reintroduce another iconic menace in the form of the Cybermen. 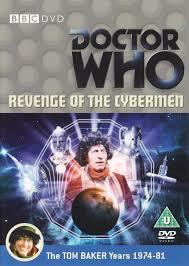 Unfortunately, the fact that it took several years for the concept to come to fruition with a script that featured heavy rewrites hardly makes ‘Revenge of the Cybermen’ the foe’s strongest showcase. ‘Tomb of the Cybermen’ proved that a weakened and dormant Cyberman army can still present an immense threat, but the attempt by ‘Revenge of the Cybermen’ to recapture that sense falls flat as it’s painfully clear that there are just four Cybermen who are hardly the epitome of their race. Robert Holmes revised the script quite a bit, and though he is unquestionably one of the great forces behind the classic series’s success, he writes the Cybermen as far too emotional to mesh with everything that has been portrayed in earlier stories. The Cybermen have always been written at their best as an anonymous force, and the individuality and emotional language on display is far removed from this concept, the title of the serial itself even implying an emotional edge. Perhaps more notable is the introduction of the Cybermen’s fatal weakness to gold, a concept that came from the original script but comes off as incredibly strange and impractical as presented here. While the idea of humanity defeating the Cyberman with a glitter gun is amusing enough while circumventing the undoubted atrocities of their battles, the Vogans living on a planet of gold but unable to think of a way to stop the invading Cybermen paints them as one of the least credible races in Doctor Who. While the location shooting in caves is unquestionably a highlight, the Vogan Civil War subplot never manages to create the intended emotional impact, and the pretentious and sometimes wince-inducing dialogue from the Vogans makes some of the scenes more difficult to watch than enjoyable. Still, there are some clever ideas hidden beneath the surface. Jeremy Wilkin may not offer the strongest performance in the role, but Kellman being a double agent does more fully flesh out the character and make him immeasurably more interesting than the one-dimensional pawn he would have been otherwise. It’s also quite satisfying that, after his jaunt away from Space Station Nerva for the preceding serial, the Doctor is once more adventuring in that certain location of space, albeit millennia before his earlier stories there. It gives a sense of cohesion to the stories without overwhelming events, and it’s a clever way to employ time travel without completely using up the limited budget. There’s a general feeling throughout that ‘Revenge of the Cybermen’ should have been something more than what was ultimately produced. Gold is literally strewn about throughout the story, but it’s never effectively employed as a moving plot device, and the Cybermen themselves are simply poor imitations of those that have come before them. This is certainly not one of the weakest stories of Doctor Who, but it does end Tom Baker’s inaugural year on a rather down note after multiple strong successive stories.